Whether you are looking to install new lighting in a room or to simply update the existing lighting in your home, Hufnagel Electric has the experience and expertise you are looking for. Do you dream of a beautiful chandelier in your foyer? Would your dining room look warmer and more inviting with a lovely hanging light fixture? Do you wish for recessed lighting to make your small kitchen look and feel bigger? Or how about some track lighting in your living room to showcase that beautiful fireplace or a ceiling fan in the game room? Whatever your lighting dreams are, Hufnagel Electric can make them come true. Chandeliers can be found in a vast array of styles and materials to create a beautiful show of light that reflects into even the darkest corners of the room. Due to the weight of such light fixtures, it is important that chandeliers be installed carefully and expertly to ensure the safety of the people in your home. Learn how a safely installed chandelier can create a warm and elegant atmosphere in your home. A professionally installed and serviced ceiling fan can work together with your existing air conditioning system to provide additional comfort and convenience. This allows for better temperature control and year-round comfort. 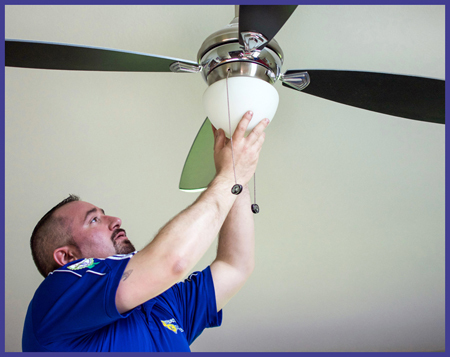 Learn more about how ceiling fans can add beauty to your home while helping you to reduce your heating and cooling costs. Besides being a source of light, flush mount fixtures can contribute greatly to the design and aesthetic of any room. Create and entirely new look in your home by simply having new ceiling lights installed. Learn how Hufnagel Electric can safely and expertly install beautiful new flush mount lighting in any room in your home. Create a contemporary and spacious atmosphere in your home by installing recessed lighting in place of a traditional hanging light fixture. Recessed lighting has become extremely popular in commercial buildings, where the right lighting can set a particular tone, provide great working light, or create ambiance where it is desired. Learn more about what recessed lighting can do for the look and feel of your home. Track and pendant lighting are flexible, versatile, stylish, and easily changeable forms of lighting that can focus attention on any particular point in a room, such as art or other decorative items. Track lighting consists of a series of adjustable lamps that are mounted along an electrical metal track. Pendant lights are available in a variety of shapes and sizes to suit your taste or style of home. Learn how Hufnagel Electric can enhance and showcase the best part of any room with beautiful track and pendant lighting.